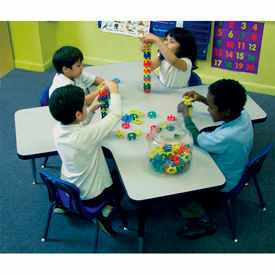 Allied - Markerboard Activity Tables with Standard And Juvenile Height Are Easy To Clean And Used For Classrooms. 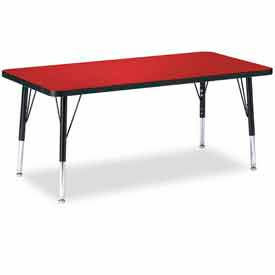 Allied - Markerboard Activity Tables with Standard And Juvenile Height are constructed of a 1-1/8" thick high pressure laminate table top with a dry-erase markerboard surface for long lasting durability. 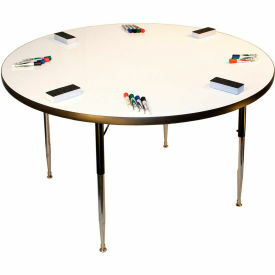 Particleboard top is covered with high pressure, dry-erase white laminate that is scratch, stain and mar resistant. Table top has black vinyl T-mold edging for safety. Easy assembly. Available in a variety of sizes. 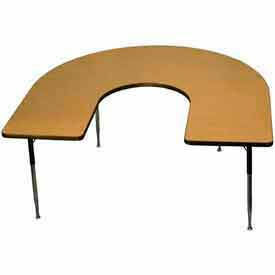 Tables shapes are Kidney, Square and Rectangle. Leg types are Juvenile and Standard. Dimensions vary.